On Saturday, August 4th something was going down downtown. If I couldn’t be there in person I at least had to monitor it. 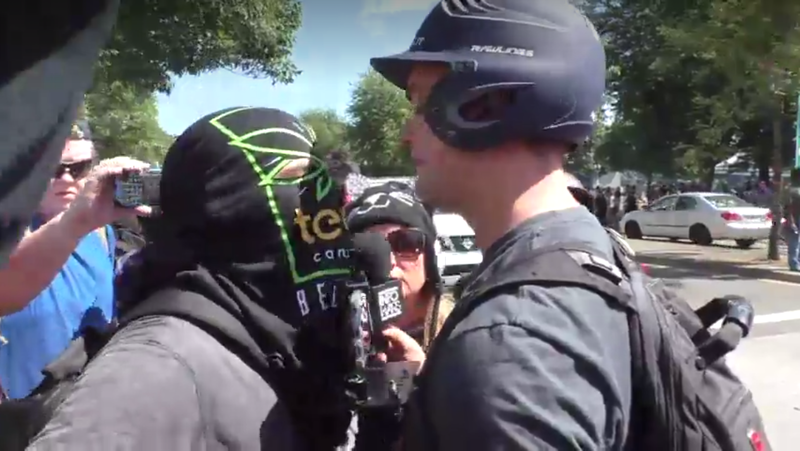 The build up had me expecting confrontation between Joey Gibson’s Proud Boy crowd and whoever showed up. I was scared off by the gun talk. One unleashed bullet would have been too much. With or without gunfire, a riot seemed inevitable. A.C. Thompson, speaking on Fresh Air, expected the Patriot’s Prayer Rally to be “the next Charlottesville.” What I ended up witnessing had the posturing of a Pro Wrestling event minus the physicality. The pre-rally provided an understanding of the importance of facing the Patriot Prayer gathers. I wasn’t sure if it was Mic Capes’ rap or his speech before hand, but I got a sense that violence didn’t have to happen. The pre-rally meeting fired people up with quotes like we have “a world to win,” and “Organize your grandma!” A speaker from Jobs for Justice said the Proud Boys were disenfranchised by getting fooled for their belief in the American Dream. The crowd chose engagement over sitting at home watching Facebook Live. The third pot of coffee had me pacing and writing illegible notes. An out-of-town interviewee described a festive atmosphere and was impressed that a brass band showed up. The feed sputtered and someone cussed. KGW-TV apologized. I lost the feed when my battery died so we switched to another phone. KGW-TV was on the counter-protest side explaining that they couldn’t cross the street due to Police Orders. 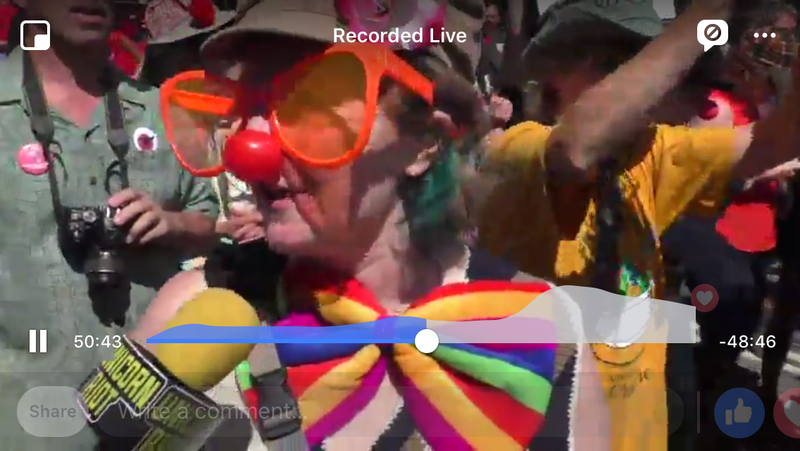 I switched to KOIN coverage which was in the middle of the Patriot Prayer Rally. “It’s not about the hate over there,” Gibson was saying. 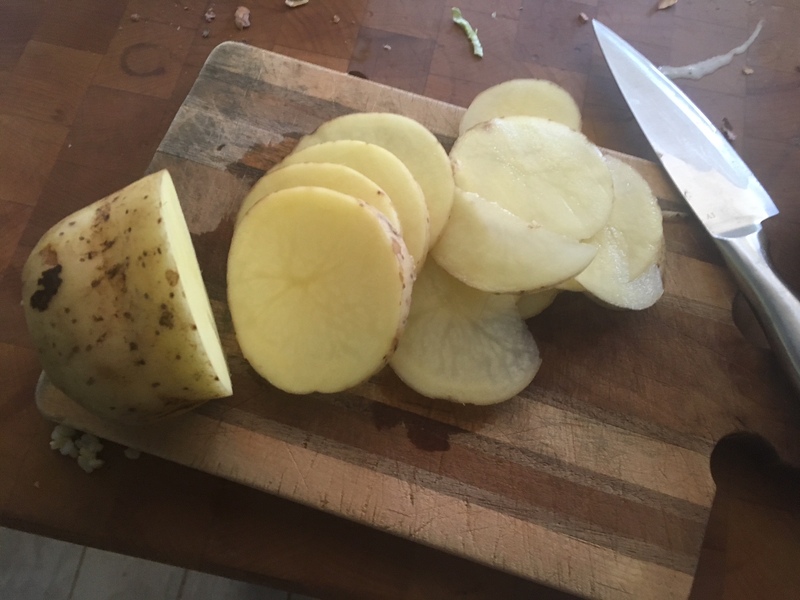 It seemed like time to make potato chips. Soon after, on the Patriot Prayer side, a discussion of a dance-off began. My thought was: Joey Gibson doesn’t dance but I have no evidence of this. The whole notion of the people downtown that day channeling their aggression through dance seemed absurd but it would have been an attempt at unity. Not much was happening with the Patriot’s Prayer Rally. Would there be group prayer, recitations of the Pledge of Allegiance or more standing around? Meanwhile the munchies were in full force. My wife was creating a dish she called “Cheese sushi,” consisting of avocado and chili oil on chunks of cheese. When KOIN’s picture froze I migrated to KATU’s coverage noting that the number of viewers was hovering between 798 and 804. The Police issued orders for people to clear a certain area or be arrested. It felt like chaos was more likely once the Police tried to manage the crowd. I returned to KOIN but their coverage seemed oblivious to the live format. A reporter was on the air texting and making phone calls to figure out if they were going live on their television channel. When Joey Gibson was swarmed with reporters an impromptu press conference broke out. Even KGW-TV managed to cross the street. Joey didn’t seem to want to talk. “Are you running for Senate?” He was asked. “Yes,” he responded. It all ended too soon and had me wondering how anyone could run out of questions for this guy. 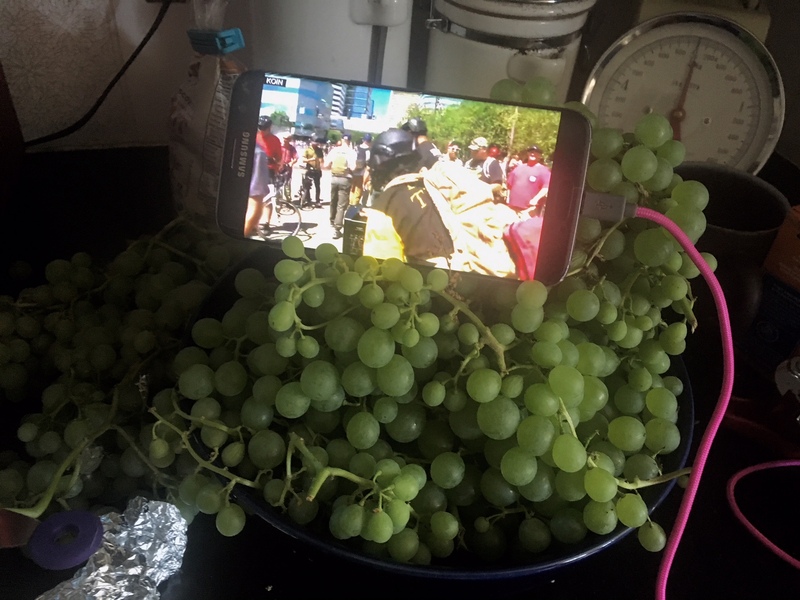 The KATU reporters kept throwing it back to the studio where Wesleigh Ogle told them, “continue to be safe out there.” The riot was portable. We headed to the porch where traffic sounds and barking dogs mixed with the coverage. I stumbled onto the feed of Unicorn Riot. It had the feel of an Saturday Night Live skit before I realized the reporter’s brain was buzzing with college knowledge. 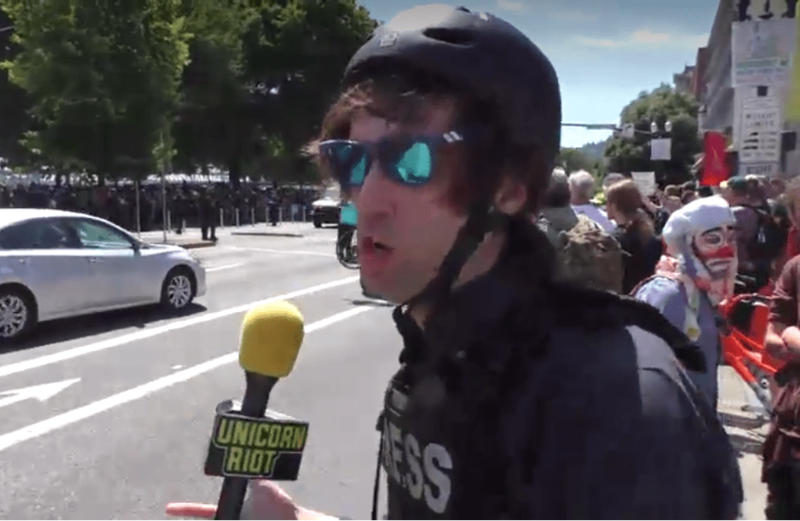 He approached people on the Patriot’s Prayer side focusing on the shirts worn by some of the Proud Boys that carried a message about Pinochet that declared he had done nothing wrong. The reporter knew history and made an effort to find out what statement the group was making. Those he talked to seemed incoherent, making comments like, “my kids are illegal” while mentioning that the Confederacy fought to free the slaves and wondering why he wasn’t reporting the facts or talking about what past presidents had done. On the other side of the street, an Infowars reporter squared off with a man in a Mexican wrestler mask. News broke that more counter-protestors arrived. By then I was into my third hour of this coverage and I felt like I was at a screening of The Sorrow and the Pity. The audio was cutting in and out. Technology can only do so much. My ears wouldn’t have been doing this if I had been there. 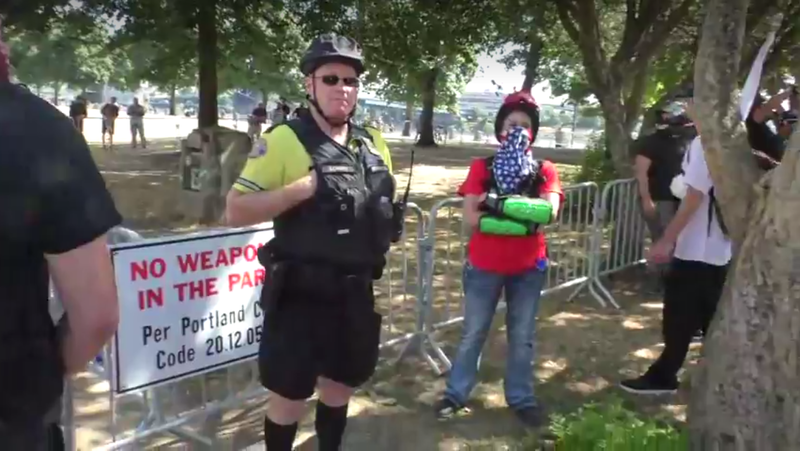 Like Pro wrestling, when the referees look the other way, a Proud Boy seemed to have snuck a weapon (foreign object) past the Police while alluding them to creep towards the counter protest side. Over caffeination created this melodrama. I lost track of how it turned out. Tension ratcheted up when the Police declared the gathering a Civil Disturbance. The crowd was expected to disburse but one man said, “We’ll go home, when they go home.” The gathering devolved into people yelling at the Police. One man flipped them off. Natio Parkway was open to traffic but the image of a Juggalo looking guy riding through the rally in the back of a U-haul pick-up truck felt out-of-place. At this point I began to get ready for a 3pm collage workshop at our local library. I took the riot into the bathtub. I had the afternoon following the downtown activities but had seen little. Much of the coverage focused on looking at the Proud Boys from across the street. 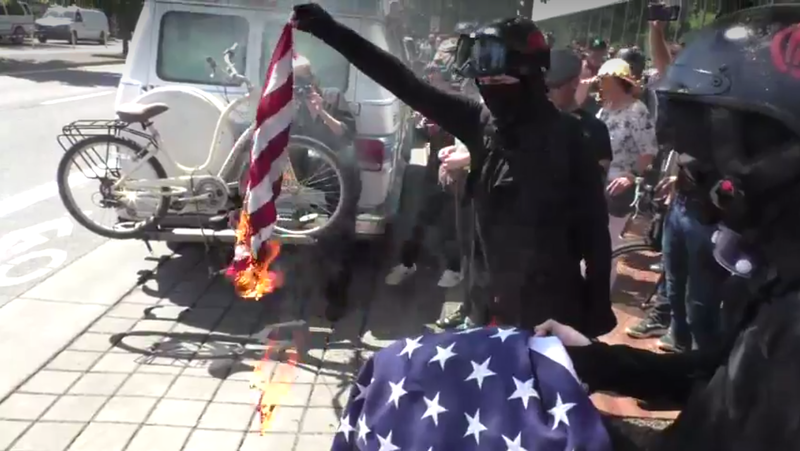 I didn’t see the Antifa presence until a member was spotted burning a flag. There were clowns too. They’re presence was mysterious, but a welcomed for its comic relief. The coverage waned. KATU’s feed skittered with views of the ground and people’s shoes. I had watched in suspense knowing that something could happen but still missed the Police crack down on counter-protestors who were accused of throwing objects across the street. I was happy to have a refuge after my riot binge. 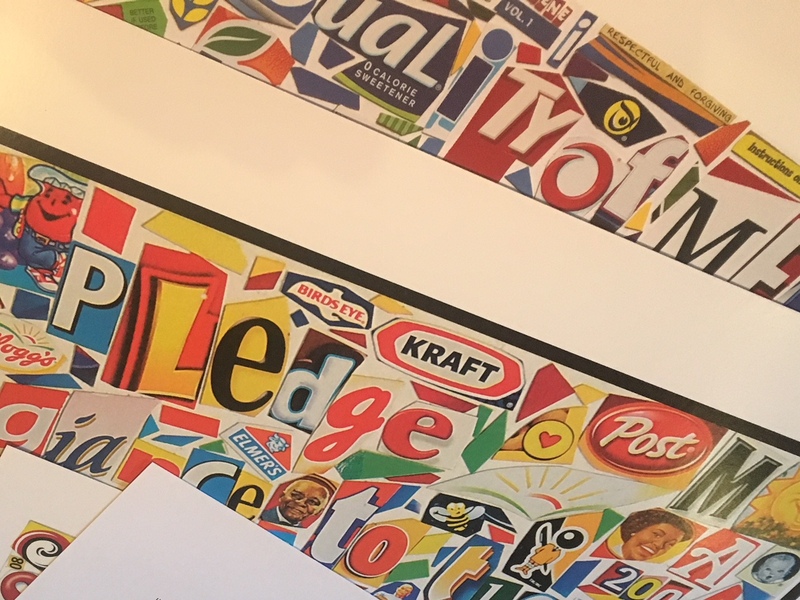 We met Michael Albert a collage artist, who was traveling the country holding workshops. I realized how much I needed an escape from the noise and tension of the downtown gathering. Michael was upbeat, talking about his art and the enjoyment of taking time to be creative. The hours I spent watching the coverage felt like an aural and visual collage of dream imagery swirling in my mind. Gladiator costumes mixed with roaming clowns while a soundtrack of chants, brass instruments and Police announcements created a feeling of underlying chaos that can break at any moment. Post Script: The title was a lifted from the Mekon’s song which I was unfamiliar with until I wrote this piece. The lyrics are impenetrable. I couldn’t find them online. The song is about a guy who never gets to go to the riot because he’s always on the toilet. I like this one—it’s “meta”! Coverage of the coverage…and the snacking. Kind of lost my mind on that one but it was better than getting tear gassed downtown.